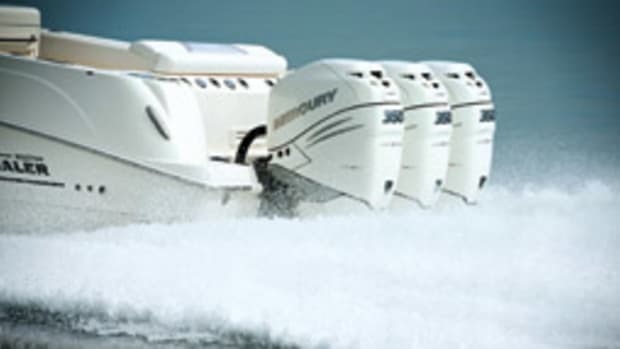 Honda Marine introduced its 225-hp 4-stroke more than 10 years ago and since then has focused on lower-horsepower outboards. In 2012, however, its most powerful engine yet will hit the market: the BF250. The manufacturer builds the BF250 around a 3.6-liter engine with a displacement of 219 inches. Honda has given it a sleeker, more streamlined design that includes a new gearcase, which reduces drag by 5 percent, according to the company. A new air induction system uses two air-cooling methods for better combustion and performance. Click play to view the BF250 in action. 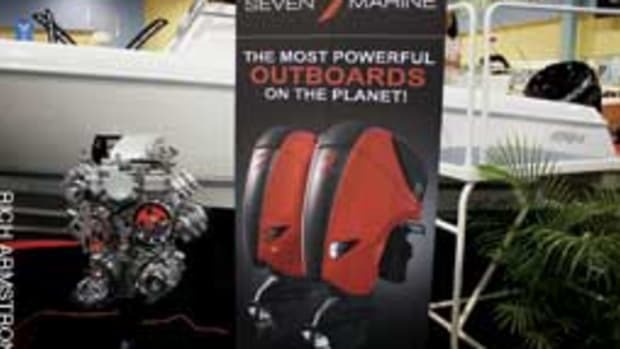 The V-6 outboard weighs 600 to 622 pounds, depending on shaft length. That&apos;s about 60 pounds lighter than Mercury’s 250 Verado and 40 pounds heavier than Yamaha&apos;s 250. The Suzuki 250 weighs about 580 pounds. Initial performance numbers look good, especially when it comes to fuel efficiency. For instance, a pair of BF250s pushing an Everglades 295 center console gets 2.3 mpg at 27 mph. And at wide-open, mileage is 1.2 mpg, still respectable. Honda has made getting to the spark plugs easier with an access cover that eliminates the need to remove the entire cowling. Honda offers a 5-year standard factory warranty on its engines. Most others back their products with 3-year factory warranties. The BF250 will be available in 2012. Pricing was unavailable.